I love my mother’s meatloaf recipe. Maybe that is not unusual, but I always find myself satisfied when I make it, and I am invariably disappointed when I try meatloaf in restaurants. 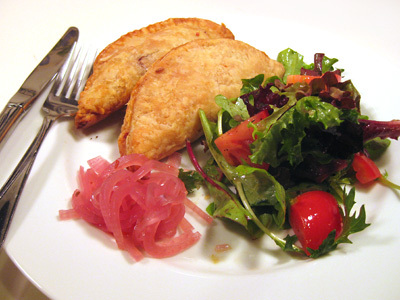 The recipe for the original recipe is posted here, and I hope you try it. 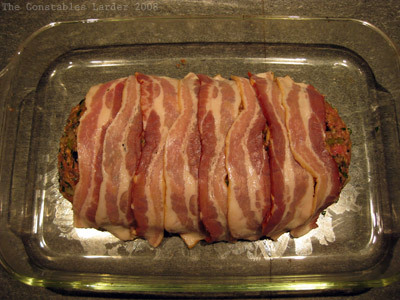 Tonight however, as a prelude to the looming Turkey Day here in the US, I changed things up a bit and brought hints of Thanksgiving “stuffing” into my meatloaf. The reaction was gratifyingly positive, so I deemed it blog-worthy. Apologies for the less-than-great photo above, but it gives you a sense of texture. Heat up a splash of olive oil in a saute pan, and saute the onions until transparent. Add the mushrooms and cook for several minutes, and then add the celery. Cook for another 5 to 10 minutes, then turn off the heat and let cool. In a large baking dish, shape your meatloaf. I usually mold it into a roughly-rectangular shape about 1.5 to 2 inches high and 4 or 5 inches wide. Then drape slices of bacon across the top. Place in the oven, and after 10 minutes, turn the heat down to 350F. Cook for another 50 to 60 minutes — if the meatloaf is firm, it should be done. 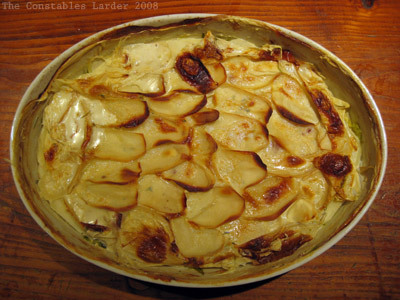 We served this with a potato, brussel sprout and celeriac gratin (in milk) — good, but I want to continue to tinker with that recipe and improve it before blogging.